This is one of the popular shrine of Busan, build in honor of the Koreans who died while fighting against the Japanese invasion (1592 – 1599) headed by Hideyoshi Toyotomi. It was a small number of unprepared Koreans who fought against the Japanese troop armed with matchlock guns. This shrine was first built in 1605. Later on, it was moved in 1652. At present, a lecture hall has also been added. The whole shrine spreads over 90,000 square meters (approximately). 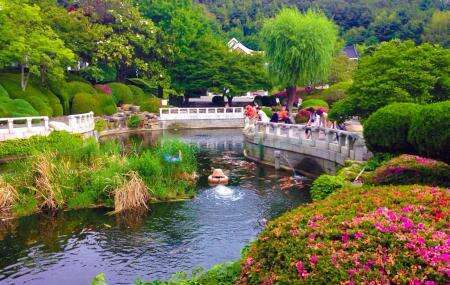 It includes a main hall, a small park, 15 other structures, a pond and a hiking trail leading to the remains of Dongnae Fortress. The main shrine is dedicated to the 22 officers, soldiers and 61 volunteer fighters who died heroically while resisting Japanese troop. The Chungnyeol tower memorializes the heroic deeds of those Korean patriots who took part in the war. It is a great place to spend quiet afternoon. No buses directly stop in front of the shrine. So, be careful to look for the shrine while travelling in bus. Once you see it, just get off the bus and backtrack. There are free admission for- Children of 7 years or below, Seniors above 65years. Uniformed military officer on the Armed Forces Day. Wounded military officers / police personnel recuperating at the hospital. Children under 13 on the Children’s Day. State guests, diplomatic mission or its executioners. Visitors for the purpose of execution of public affairs, public interest, academic project. Disabled (Also no charge for 1 companion for 1st – 3rd degree disabled). Men of merit participated in war. Elementary, middle school and high school students visiting for educational purpose. People normally club together Gamcheon Cultural Village and Samnak Ecological Park while planning their visit to Chungnyeolsa.